Meaning (honorable (Fröhmke)) most important. Adelheid - feminine name dated to 1361 in Bahlow/Gentry, page 4.
in gleðill - descriptive byname meaning "fun, good cheer", GB p. 21. The actual entry in GB is simply "gleðill", but the element "in" was added to convey the intended meaning of "the joyful". OSCAR finds the name (Beatrix of Thanet) registered exactly as it appears in August of 2016, via Calontir. OSCAR finds the name (Thorbjorn Bjornsson inn danski) on the Calontir LoI of September 30, 2016 as submitted. Old Item: Or, in bend two capital letters "B" azure within a bordure gules, to be released. This is a Pennsic submission. A search of the .pdf for the term soldering, makes mention of soldering irons in use to at least 1427. Argent, a chevron rompu rayonny to chief purpure between two flutes palewise vert and a Lochaber axe sable. This device is returned for combining two complex lines of division, which has consistently been grounds for return since at least 1992. This redesign leaves out the rayonny line of division, and changes the flutes to weaver's tablets. The name was registered on the June 2017 LoAR. See attachment for documentation of the two-barred cross in this submission. It is an apparent variation of the Hungarian Cross, aka the Patriarchal Cross. 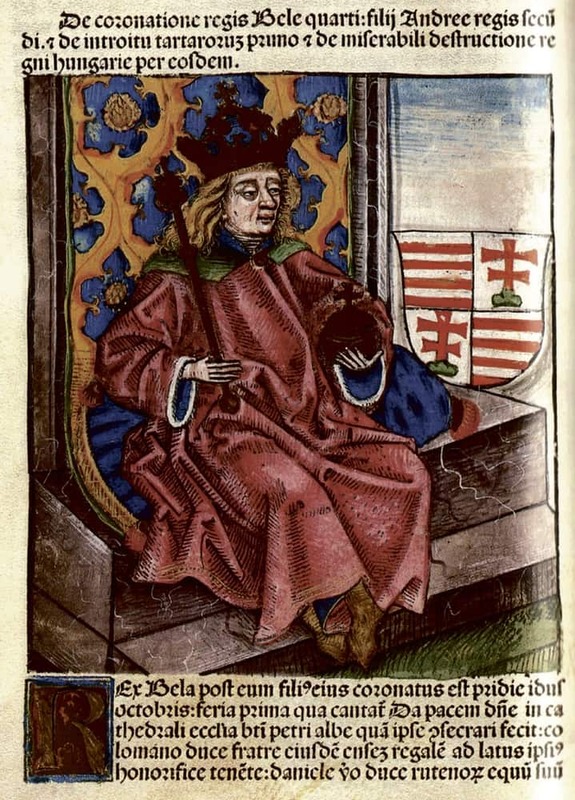 Seen in image of ruler Bela IV of Hungary, issuing from a trimount. OSCAR thinks the name is registered as Lynette Jaclyn Davéjean in March of 1993, via the Middle. Azure, a dove and on a chief argent between two roses proper, for augmentation on a delf purpure a cross of Calatrava Or. The submitter's device was registered in 1993 via the Middle: Azure, a dove and on a chief argent, two roses proper. The registered standard augmentation for Calontir is Purpure, a cross of Calatrava and a bordure Or. For reasons of contrast, this submission omits the bordure. Correction to Device (2017-Aug-31 07:08:29): As was politely pointed out, this is an Augmentation, not a new device. I apologize for any confusion caused by my error. OSCAR finds the name registered exactly as it appears in May of 1994, via Calontir. Old Item: Argent, a sea-horse azure within a bordure sable, semy of mullets of four points argent, to be released. Rauða- prepended byname meaning Iron-Ore-, found in Beirr Bassi, page 26. Smiðr - masculine given name found in Geirr Bassi, page 14. SENA PN.2.B. Name Phrase Requirements states, "A registerable personal name must be made up of at least two name phrases: a given name and at least one byname..." This name fulfills that requirement as it has a (prepended_ byname and a given name. Meaning (Villicus - steward) most important. Shiozaki - Japanese surname dated to 1600, found in NCMJ, page 326. Sóma - Nordiskt runnamnslexikon - page 86 - Feminine form of OW.Norse somi m. "honor, respect"
Tyrvadottir - patronymic byname. The patronym appears in Geirr Bassi on page 15 as Tyrvi; the patronymic formation drops the last "i" and replaces it with an "a". The example given is Snorri to Snorrason. OSCAR finds the name registered exactly as it appears in August of 2015, via Calontir. Þorin - Fellows-Jensen, Scandinavian Personal Names in Lincolnshire and Yorkshire cites a Grunekell f. Thorin. This shows Thorin as a Latinized Norse name 1066-69. [Thorin Ó Séaghdha vörðr, 2/2008 LoAR, A-Caid]. Commentary is due by 24 Sep 2017 either in OSCAR or via email to <eyas@calontir.org>. The online commentary meeting will be 25 Sep 2017. Ic þe þancie (I thank you) in advance for your assistance! OSCAR counts 9 Names, 11 Devices, 2 Device Changes and 3 Badges. There are a total of 25 items submitted on this letter.